​Spectators are set to be thrilled by the extraordinary talent of fearless Carriage Drivers as Extreme Driving supported by Karen and Hugh Scott-Barrett, premieres at CHI Royal Windsor Horse Show on Sunday 12 May. 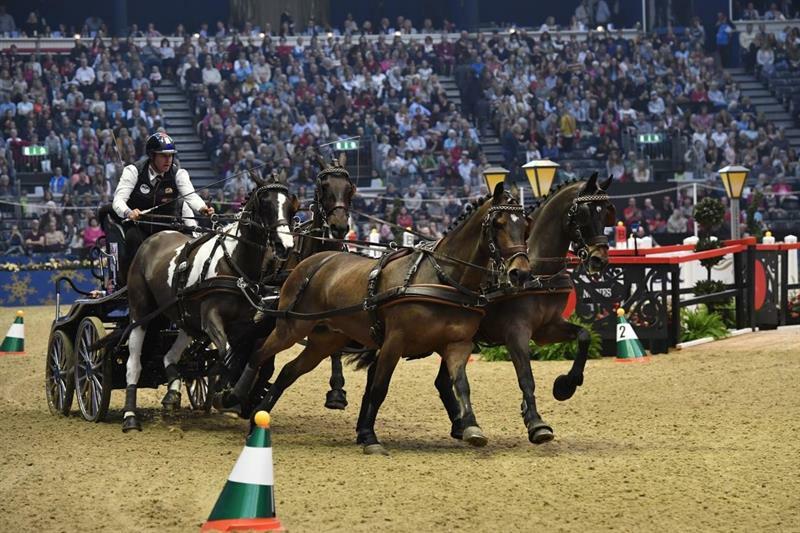 Spectators are set to be thrilled by the extraordinary talent of fearless Carriage Drivers as Extreme Driving supported by Karen and Hugh Scott-Barrett, premieres at CHI Royal Windsor Horse Show on Sunday 12 May. World-class competitors will battle it out in the Castle Arena, as they manoeuvre a team of four galloping horses around a technical course that demands exceptionally high levels of skill and speed. In an exciting double first for the sport, this will mark not only a Royal Windsor debut, but also the first time the event will be run in an outdoor venue. And, this will be staged in front of the spectacular backdrop of Windsor Castle. The four-in-hand Driving competition brings with it a £10,000 incentive, which combined with the Land Rover International Driving Grand Prix, creates one of the richest prize funds in Carriage Driving. The total prize fund equates to over £22,000 and reaffirms Royal Windsor’s importance within the international equestrian circuit. The increased prize money is expected to attract many of the world’s most skilled Carriage Drivers, promising an unmissable afternoon of entertainment and top-grade competition. Also included in the week’s Carriage Driving programme is the three-phase CAIO4* Land Rover International Driving Grand Prix. Bringing adrenaline pumping, mud-flying action, the competition gives contenders the opportunity to qualify for the FEI Driving World Cup™ Final. Created by HRH The Duke of Edinburgh in the 1970s, the competition comprises three phases: Driven Dressage (Thursday 9 & Friday 10 May); the Marathon Stage (Saturday 11 May); and Cone Driving (Sunday 12 May).